Towards the end of 2017, JOLED started commercial production of its 21.6" 4K OLED panels at its low volume production pilot 4.5-Gen line. JOLED's mass production line will be established in Nomi City, Ishikawa Prefecture, with a capacity of 20,000 monthly 5.5-Gen (1300x1500 mm) substrates. 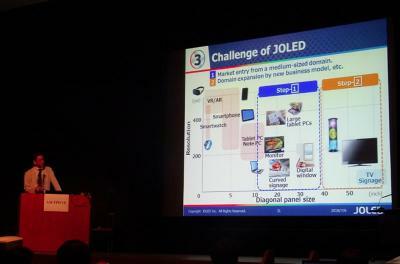 JOLED plans to begin mass production in 2020 at the new fab - and to produce 10- to 32-inch OLED displays for automotive displays, high-end monitors and more.